Public Works crews pave Saline Street in Four Mile Run. Public Works is trying to take the mystery out of paving. Libertus said long-time residents said the street had not been paved in 30 years. That probably would not surprise Pittsburgh Public Works director Mike Gable. The city of Pittsburgh is budgeted to spend $613 million on operating and capital expenses this year. Of that, roughly $15 million will be spent on paving projects. Despite representing just slightly more than 2 percent of the budget, it is some of the most sought after money in the city. 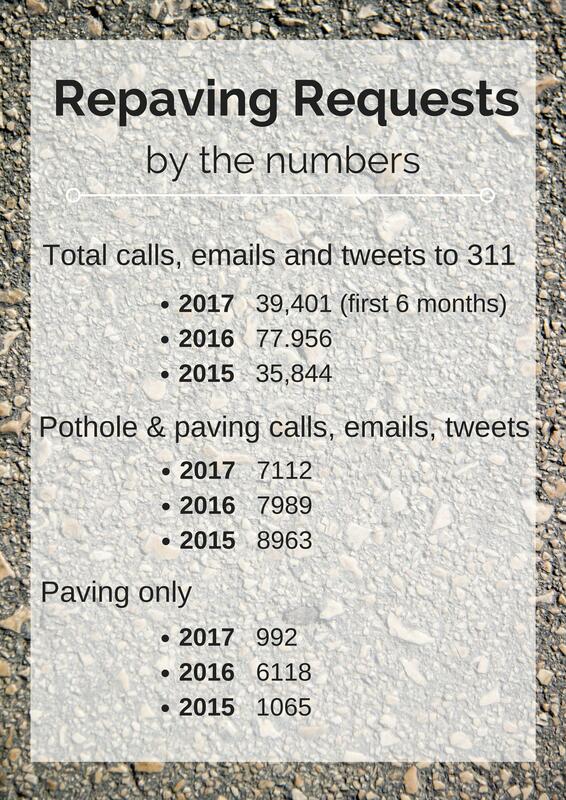 In 2016, nearly 8,000 paving requests and pothole complaints came into Pittsburgh’s 311 center. That works out to about 22 calls, emails or tweets every day. This year, the city expects to pave between 50 and 60 miles of city streets based on the budget passed in December. But with demand from residents out-striping supply, the city has to make some tough decisions. Pittsburgh City Councilwoman Theresa Kail-Smith said her office takes at least a call a week asking for a specific street to be paved in her district. “Your heart is always wanting to help more, that’s what we do, we want to help more people," she said. "So, when you have to say no to someone, it’s just gut wrenching." Despite chairing council’s public works committee, Kail-Smith sends all of the request directly to Gable’s office. In the past, those request might have been ignored or moved to the top of the list. It all depended on the political clout behind it, said former city councilman Jim Ferlo. “I tried not to actually get involved too much in asphalt because it was always a loosing proposition,” said Ferlo, who served on city council from 1988 to 2003. “I would never B.S. people,” Ferlo said, adding that he could only pass along requests to public works. When Pittsburgh Mayor Bill Peduto was a member of city council, he tried to point out the arbitrary nature of the paving program by suggesting that he would place a bobblehead doll on his car’s dashboard and drive every street. The streets where the head bobbed the most would get paved, he said. After Peduto was elected, the city launched a more data-driven system for paving with the help of a company called Cartagraph and its electronic sensing equipment. The plan is to update that data every three years. Other factors are considered when choosing the streets, including 311 calls, observations from public works supervisors and, of course, input from council members. A recently repaved Saline Street meets the edge of Whitaker Street in Four Mile Run. Planned utility work also has an impact on choosing which streets will get paved. Ferlo said, in the past, there was no coordination between the city and the utility companies. It was not unusual for the city to pave a street only to have it dug up a few weeks later by a utility doing routine line repairs. In fact, in the late '90s there was open speculation on council that the utilities were intentionally choosing recently paved streets because they were easier to dig in that streets that had hardened over time. By law, utilities must repair and repave streets they disturb, but they only have to fix the portion of street they dig up. So, Gable started to meet regularly with the utilities to find out where they planned to do maintenance work. Then he drew up a plan to share the burden. “For example, the utility company wanted to do [dig trenches in] 20 streets. And so what we worked out was they trenched 20 streets, but we got them to pave 12 [streets] curb-to-curb and we paved the other eight curb-to-curb,” he said. Gable said he was able to add about 8 more miles to this year’s paving program through the coordination effort. But even that is not enough. Gable said to catch up with the backlog of streets, he needs to be paving about 100 miles a year. That’s compared to this year’s roughly 60 miles. He said he gets thank you notes from time to time from people thanking him for paving their side street. He said he hopes they enjoy it, because it might never happen again in their lifetime. 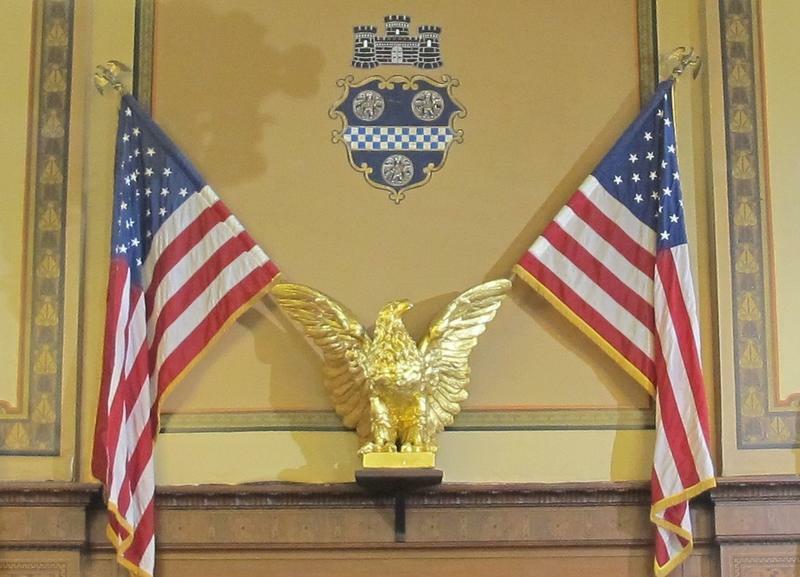 On Monday, the Pittsburgh City Council gave preliminary approval to a budget amendment that would pull $285,000 out of the city’s paving fund and spend it on community service efforts. Pittsburgh’s 2016 budget allocated $75,000 in federal Community Development Block Grant (CDBG) funds to the Greater Pittsburgh Community Food Bank and another $74,000 for the Pittsburgh Community Services hunger program, but those lines were zeroed out in the 2017 budget proposal submitted by the mayor’s office. Kiss your favorite pothole goodbye. Officials with Pittsburgh’s Department of Public Works released its 2016 street paving list Thursday, which includes 49.5 miles of streets to be repaired between April 1 and Oct. 31. The city also has an interactive map, where residents can track which streets – and specific spots on those streets – will be paved, milled or repaired in some way. It’s expected to be updated as changes arise. 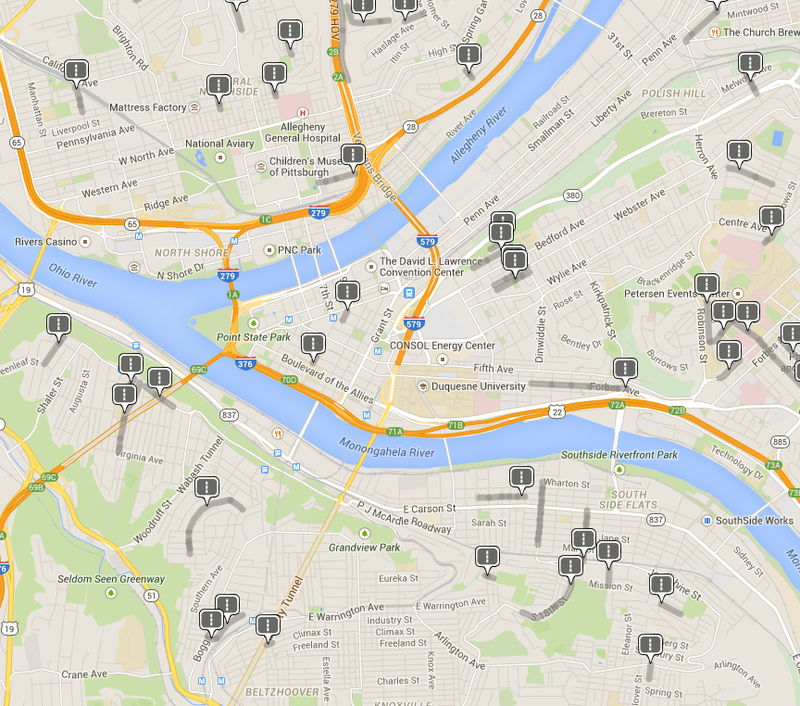 As part of its ongoing effort to make data more accessible to the public, the city of Pittsburgh has created an interactive map using the list of streets scheduled to be repaved this year. Rather than reading down a long list of streets divided by often confusing intersections, a user can simply zoom in on a neighborhood and click the thoroughfares that are highlighted in grey. 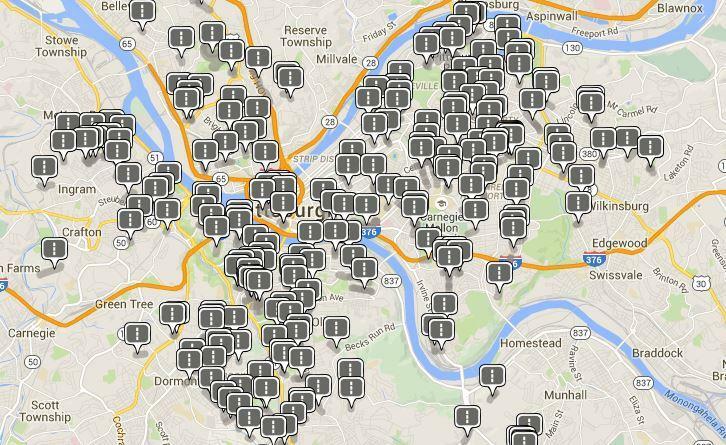 The city of Pittsburgh wants all police officers to be wearing body cameras within two years instead of six. In the wake of civil unrest after grand jury decisions not to indict police officers in the killings of Michael Brown in Missouri and Eric Garner in New York, the Peduto administration will shorten the timeline for implementation of such technology. Amendments to Mayor Bill Peduto’s 2015 budget proposal that would free up money for the purchases came before City Council on Monday.